Evennia is an open-source library and toolkit for building multi-player online text games (MUD, MUX, MUSH, MUCK and other MU*). You easily design your entire game using normal Python modules. Apart from supporting traditional clients, Evennia comes with both a game web-client and a web-server out of the box. The Demo is a small live instance of Evennia with a sandbox and a small quest area to try out. You can connect in your browser from the link above or using telnet to http://silvren.com, port 4280. If you have any questions you can chat live with developers directly from the demo! The Dev Blog is the lead developer's musings on Evennia's systems, future plans and other general aspects of game design. Evennia's Source Code is hosted on github and is where the main Evennia development effort is happening. Here you can download Evennia itself, read the documentation and report bugs and ideas to our issue tracker. The Forum is a discussion group where you can ask questions as well as read the latest news and announcements. Please note that to limit spam your very first post will have to be manually approved. Most development discussion happens in our IRC channel, #evennia on irc.freenode.net. The channel is logged. Please understand that people are in different time zones and have busy lives. So if you don't get a reply right away, be patient! If you really can't hang around for a reply, post in the forum instead. You can also Search all Evennia resources - this is a Google search function that queries both the codebase, wiki documentation, forum history and IRC log. Out-of-the-box Evennia MUD game. 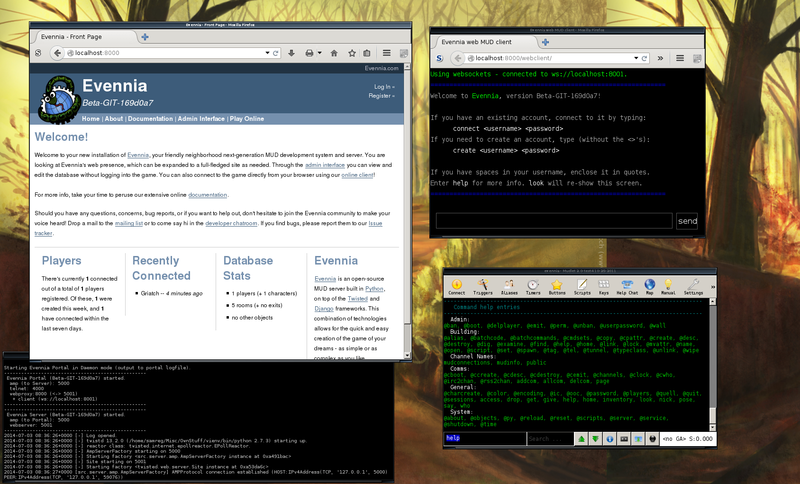 Both a third-party mud-client and its own browser client is connected to the running server.